Ok, really not sure how this 'inspire's' me.... But just go with it. Please tell me I'm not the only one?! I think this is completely sane! I mean, I often cry in books. 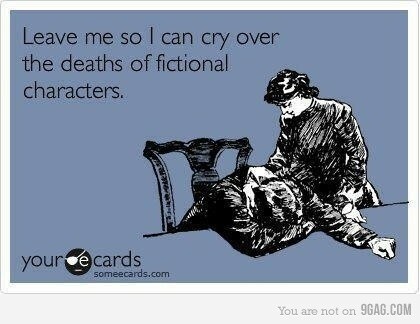 The characters don't actually have to die for me to cry though. I'll just be crying left right and centre. This is why I can't read in public... AWKWARDDDD! This is so true! Sometimes I might be reading in the living room but if I know something bad is going to happen, someone's going to die or the end is near and I know it's going to be BAM full of emotion, I go lock myself in my room. You're definitely not the only one!!! I agree with Monaliz, that's one of the reasons why I don't like watching movies with other people. AWKWARD! And it's the same with books. They don't have to die for me to get really emotional. So embarrassing! Oh! When Sirius died in Harry Potter, I just sat in the middle of my lounge room, family all around me, and let out the worst ugly-cry of my life. No one could understand it. But memes like this are a reminder that there are people out there who do understand. I'm not alone, and that's inspiring. Crying in public over a book is totally awkward! I like reading on the train, but never sad books. Also not too funny books, because sometimes I just can't stop laughing, and then people start staring at me...not my favorite moments. Ficitional characters become our friends and then when they're ripped away from us, it's like our soul is coming loss. How could we not shed a tear or too? But that's what makes reading so great and it is when you know with certainty that you have picked up a damn great one. Ahahaah! Amy, YES! And you know, it's kind of inspiring in that it... you know, inspires us all to laugh together? I LOVE IT.